10 - Stats like this: Steve Smith is the first Giants player since 1988 to have 100+ yards receiving two regular season games against the Cowboys. (Make it 3 in a row). 9 - A slow motion replay of Rich Seubert pancaking Keith Brooking. 7 - Another slow motion replay of Chris Snee pancake blocking Brady James on the Manningham touchdown. 6 - A Brandon Jacobs replay dragging Keith Brooking for 4 extra yards. 2 - The Michael Boley/Tony Romo sack replay. 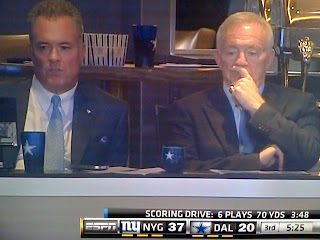 1 - Jerry Jones in complete shock watching his team get dismantled on national television.